The log4net is NOT included (either referenced or added to Web.config) in the Wisej project. It MUST be a coincidence (but a VERY strange one!) that both Wisej and log4net versions are 1.2.15. It is not a real problem as I said this is a test project and I could delete it without a second thought. But I thought I should report it in case it points you to any deeper problem. We don’y use log4net. It looks like an assembly in the project is referencing it. 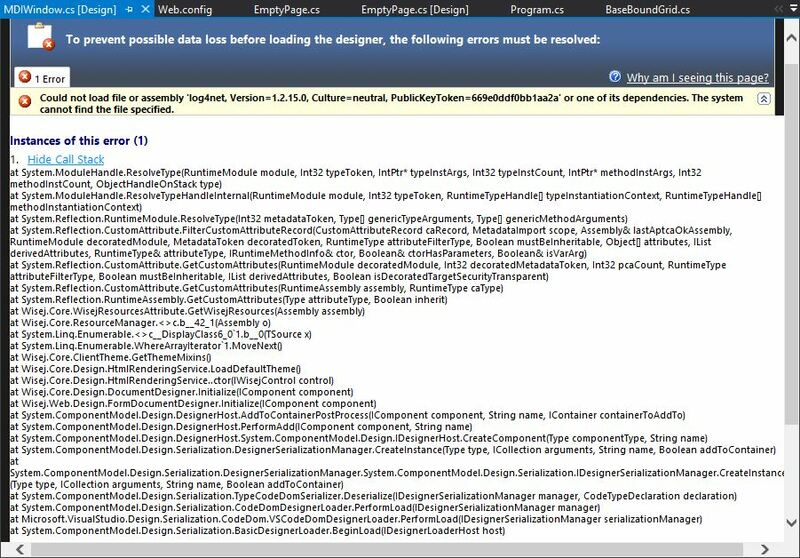 VS designer has a tendency to copy the assemblies it uses and sometimes it keeps loading a cached build. One way to reset it is to clear, rebuild, close and reopen VS.
Referenced assemblies are usually loaded when a method using it or a derived class is loaded. Something at design time must have triggered it. Can you check if a referenced custom assembly (not Wisej) references log4net? Luca, you are right! Cleaning the solution, exiting VS and reopening it did the trick. So it turns out it was a caching problem. I can see from the stack trace that the assembly loading is triggered by Wisej inspecting the referenced assemblies for resources. We’ll wrap that in a try/catch and rethrow a more meanigful exception with the name of the assembly that failed.